Wheat grain (Triticum spp.) is a major staple food that provides about 20% of food energy and protein worldwide. Wheat is also an excellent energy source for farm animals: in 2007, 102 million tons (16.7% of worldwide production) were used to feed animals. This proportion is higher in industrialised countries: in the EU-27 in 2007, 42% of wheat production was used as feed (FAO, 2011). Feed wheat is often surplus to human requirements or low-quality wheat unsuitable for human consumption (low test weight or damaged wheat), but wheat is also grown specifically for feed purposes (Blair, 2008; Lalman et al., 2011). The inclusion of wheat grain in feeds depends on the relative market prices of the major feed grains. When maize, barley and sorghum are expensive, or when wheat prices are depressed, wheat becomes a valuable option (Lalman et al., 2011). In some countries, the use of home-grown feeds has gained interest because of their lower cost and wheat grain has been increasingly used in livestock rations (Blair, 2011). The wheat variety available for animal feeding depends on the region: hard red spring or winter wheats are generally used in North America while soft wheats are more common in Europe. Due to very early selection of specific traits for bread or pastry making, wheat grains are highly variable in colour, form and starch types. Bread wheat grains are generally vitreous, whereas soft wheat grains are more opaque (van Ginkel et al., 1996). Wheat grain is basically a source of energy in the form of carbohydrates (starch) enclosed in outer layers that form the bran. Unlike barley or oats, wheat grain is easily dehulled by threshing. Wheat grain is highly palatable and is a digestible source of nutrients for all classes of farm animals. However, like other carbohydrate-rich feeds, it must be fed with caution to ruminants and horses as it may cause digestive upsets (Blair, 2011; GNIS, 2011). Wheat grain can be fed whole or processed in many different ways. It can be fed in association with other ingredients, or mixed and processed into pellets in concentrate feeds (GNIS, 2011; Feillet, 2004). 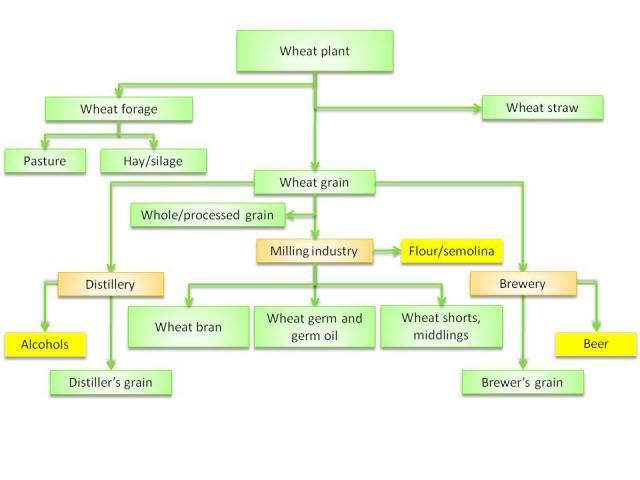 Wheat grain unsuitable for food processing (due to disease, insects, frost, sprouting, low test weight, etc.) can be fed to farm animals. The feeding value and palatability of such grain may be similar or lower than that of good quality wheat, depending on the extent of the damage. It may be necessary to mix it with another cereal grain and to screen it for mycotoxin contamination (Bell, 2003). Note: durum wheat (Triticum durum Desf.) is used for pasta and semolina while the common wheat (Triticum aestivum L.) is used for bread making. Durum wheat has hard kernels, while common wheats have kernels ranging from soft to hard (such as hard red spring or winter wheats grown in North America). As a result, some confusion may occur when durum wheat is called ‘hard wheat’, with no specific term for hard common wheats. Wheat grain is available worldwide. In 2007, the main wheat producing countries were China, India, the USA, the Russian Federation, France, Pakistan, Germany, Canada and Turkey. Most of these producers are also the main exporters, India being the only one that does not export its wheat production. The major importers in 2007 were Brazil, Italy, Egypt, the Netherlands, Japan, Indonesia, Algeria, Belgium, the United Arab Emirates and the USA (FAO, 2011). In the European Union, almost half of the production goes to animal feeding. The major users of feed wheat are the Russian Federation, Germany, France, China, the United Kingdom, Spain, Canada, the USA, Ukraine and Denmark (FAO, 2011). Wheat grain should be stored in a cool, dry and aerated place to prevent heating and/or gas accumulation (due to germination) and condensation that may lead to mold development. Wheat grain should be dried to below 14% moisture and kept in a clean place for storage (Boudreau et al., 1992; Wilcke et al., 1992). Wheat grain can be fed whole or processed. Many processes can be used, including dry rolling, steam rolling, flaking or grinding followed by pelleting. The effects of processing (or absence thereof) are highly dependent on the animal species to be fed and on the production required: for instance, whole wheat grain is more suitable for lambs whereas pellets are more suitable for cows (Tait et al., 1973; Cabon et al., 2002; Owens et al., 1997). Too fine grinding may cause flowing issues in feeding equipment (Blair, 2008), as well as digestive upsets in animals. 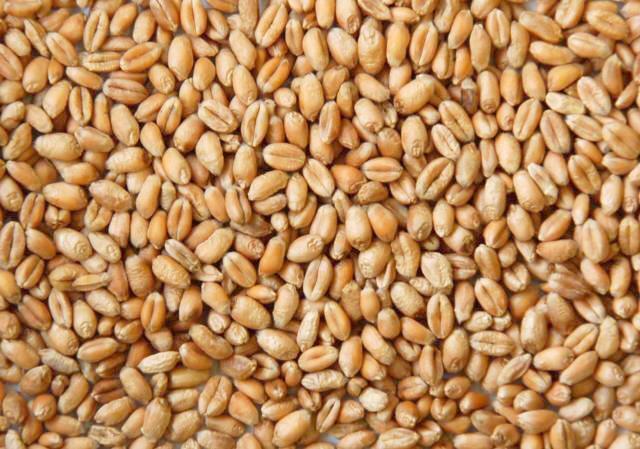 Low test weight wheats, which are often used to feed livestock, have variable kernel sizes that make them more difficult to process: some grains may end up unprocessed or ground too finely. In order to prevent too fine grinding, it is recommended to err on the side of under-processing when processing low test weight wheats (Lardy et al., 2000). Wheat is primarily a source of energy due to its high starch content (about 70% DM). It is richer in protein than maize and barley (11-13% DM for soft wheats vs. 8-10% for maize and 11-12% for barley) and can thus be used as a replacement for maize as a high-energy ingredient requiring less protein supplementation than maize. Hard wheats and durum wheats have a much higher protein content (more than 14-15% DM for durum wheats) than soft wheats. Due to the natural separation of husk from the grain during threshing, the fibre content of wheat is very low (crude fibre less than 3%), slightly higher than that of maize, but half that of barley and much lower than that of oats (Feedipedia, 2013). The chemical composition of wheat can be highly variable, particularly with regard to starch and crude protein content, depending on species, cultivars, growing location, climate, soil fertility, etc. (Zijlstra et al., 1999; Zijlstra et al., 2001; Kim et al., 2005). For instance, wheat containing up to 23% DM as protein and 80% DM as starch has been reported in the literature, as well as wheat containing as little as 9% protein and 50% starch (Kim et al., 2005). Such variability means that periodic testing of batches of wheat is highly recommended (Blair, 2011). Wheat protein is relatively poor in lysine (2.9% of crude protein) but due to its higher protein content wheat contains much more lysine and more tryptophan than maize (Kim et al., 2005). Wheat grains with low test weights have a lower starch content but are slightly richer in protein and fibre (Lalman et al., 2011). A benefit of wheat as a feed ingredient is that the presence of viscous gluten improves pellet quality, reducing the need for a pellet binder. This effect becomes noticeable when wheat is included at 10% or more in the pellet (Blair, 2008; Bell, 2003). Wheat storage proteins (albumins, gliadins and glutenins) also act as chemical defences against pathogens and phytophagous animals. Gluten, a protein composite of gliadin and glutenin, is known to cause digestive disorders in gluten-sensitive humans. Other digestive diseases (including allergies) have been linked to gliadins. Wheat albumins are reported to have an anti-amylase, anti-tryptic and anti-lipase activity in some animal species (De Bry, 2001). Gluten becomes viscous in the presence of water, and while this property is highly desirable for flour processing, it can be dangerous to animals fed large amounts of wheat flour or finely ground wheat. Gluten was reported to form dough balls in the stomachs of pigs, blocking digestion and starving the animals to death (De Bry, 2001). In cattle and horses, finely milled wheat forms a paste-like mass in the mouth and the digestive tract which may lead to digestive upsets (Blair, 2011; Martin-Rosset, 2012). Durum wheat has a higher gluten strength and rolled grains have been reported to become pasty and sticky (Lardy et al., 2000). Pentosans (among which arabinoxylans) are polymers of pentose sugars that increase diet viscosity and have an antinutritional activity in poultry. Varieties with low pentosan content should be preferred for poultry (Adeola et al., 2004; Choct et al., 1990). Wheat grain is rich in starch, which is fermented more rapidly than the starch in maize, resulting in a greater potential for digestive upsets, including acidosis, bloat, laminitis and reduced or erratic intake patterns (Fulton et al., 1979; Lardy et al., 2000). Wheat grain can cause acute acidosis if fed in large quantities to unaccustomed ruminants. The fermentation of large amounts of starch in the rumen lowers rumen pH, resulting in rumen stasis, a decrease in forage digestion, diarrhoea, dehydration and metabolic acidosis. If acidosis reaches the blood, it can cause heart failure, kidney failure and death. Acute acidosis occurs in ruminants that accidentally consume large amounts of cereal grains. When animals are progressively introduced to wheat grain in combination with hay, no particular problems occur even at high inclusion levels (Walker, 2006). The high starch content may also cause various digestive disorders in horses (Trillaud-Geyl et al., 2006; Martin-Rosset, 2012). Wheat is susceptible to fungal diseases, notably by Fusarium species. Fusarium infection (Fusarium Head Blight, also called scab) occurs during flowering when the weather is warm and wet, or during storage when the grain is not stored properly. Fusarium diseases are a major source of grain losses: in Argentina, several Fusarium epidemics of varying severity have occurred in the past 60 years in the Central-North wheat production area, where yield losses were estimated to average between 20 and 50% (Stenglein, 2009). In China, severe epidemics of Fusarium Head Blight have affected more than 7 million ha of wheat and caused yield losses of more than 1 million t (Leonard et al., 2003). In Europe, EFSA has stated that the estimated exposure to the sum of T-2 and HT-2 trichothecenes based on the available occurrence data are considered unlikely to be a health concern for ruminants, rabbits and farmed fish. For pigs, poultry, dogs and horses the risk of adverse health effects is also low (EFSA, 2011). Post-harvest fungal infections also cause mycotoxin contamination. In addition to Fusarium species, Aspergillus and Penicillium fungi benefit from elevated moisture and heating, allowing them to develop during storage, resulting in a production of ochratoxins and aflatoxins. It is important to store well-dried wheat grain (less than 14% moisture) at a temperature below 20°C. Pests should be prevented from entering the storage area as they increase heat and moisture, and favour fungal development (TIS, 2013; Birck et al., 2006). Sprouted wheat should be screened for aflatoxin if mold is present (Lalman et al., 2011). Wheat is used in ruminant diets as an energy source. It can replace maize as a high-energy ingredient in concentrates, with the additional benefit that it requires less protein supplementation than maize due to its higher protein content. While slightly less rich in net energy than maize (96% of maize NE), wheat, when adequately processed, is highly digestible for ruminants (more than 86%) (Sauvant et al., 2004). Due to its higher protein content and lower fibre, wheat has a higher energy value for ruminants than barley (Sauvant et al., 2004), though similar growth rates from wheat and barley have been reported in steers fed grass silage (Steen, 1993). Wheat is very palatable if not ground too finely (Blair, 2011). The rapid rate of starch digestion, as well as the gluten component of the protein, makes wheat more difficult to feed than other grains. The rate of in vitro disappearance of starch of dry-rolled wheat has been reported to be higher than that of dry-rolled maize (Stock et al., 1990). Wheat is more rapidly, extensively, and somewhat erraticly, fermented than other cereal grains (Fulton et al., 1979). This can result in digestive problems such as bloat, laminitis and acidosis when too much grain is fed, when there are too many fines or when animals have been introduced too rapidly to the diet (Blair, 2011). As noted in Potential concerns above, the viscosity of finely milled wheat may lead to digestive upsets due to the formation of dough. Low test weight or damaged wheats generally give performances similar to regular wheats. Low test weight wheats tested in beef cattle produced very similar performance compared to higher test weight grains (Lalman et al., 2011). No relation was found between test weight and metabolizable energy (ME) in ewes (Wilkinson et al., 2003). Feeding sprouted wheats did not affect performance, feed efficiency and feeding value, but it was recommmended to limit the inclusion rate at 20% (diet DM) to minimize the risk of reduced feed intake (Lalman et al., 2011). Severely frosted wheat grains fed to wethers had a slightly lower ME (6% less) than unfrosted wheat but those values fell within the normal observed ME range for wheat (Richardson et al., 2001). Wheat can be included at up to 40-50% in the diet of milking cows, though different levels are recommended depending on the processing and on the other ingredients of the diet (Ewing, 1997; Blair, 2011). For instance, 4-5 kg/d (25-30% of diet DM) of processed (rolled or ground) wheat fed to cows after an adaptation period is considered safe, but it is possible to include up to 8-10 kg/d in the diet of grass hay-fed cows. More than 5 kg/d of wheat given to cows fed silage maize is reported to decrease intake (Laurent, 1988). Cows should be introduced progressively to a wheat-based concentrate over 2 or 3 weeks, with an initial level not exceeding 10% of the concentrate (Blair, 2011). Dairy cows cannot utilize efficiently whole wheat grains (Laurent, 1988) and processing, such as grinding, rolling and pelleting, can substantially increase their digestibility. In general, wheat grain is fed dry and rolled or ground. A general recommendation is that coarse rolling should be used to break the kernel into two or three pieces, and good results have been obtained with coarsely ground wheat (hammer mill screen size of 4.5-6.4 mm) (Blair, 2011). It was shown that rolled wheat gave a better response than ground wheat, but only in early lactation (Laurent, 1988). Tempering wheat by adding moisture has been shown to be effective in reducing fines and maintaining milk yield and composition (Blair, 2011). It has been noted that crushed wheat grain fed with pasture hay (grass or legumes) to dairy cattle reduced the pH of rumen fluid and the digestibility of fibre (Leddin et al., 2009; Leddin et al., 2010), though this effect was limited when wheat was included at less than 30% of the diet (DM) (Laurent, 1988). Heat processes can be used: 20% steam-rolled wheat included in the diet of dairy cows did not compromise production or cause subacute rumen acidosis, when adequate fibre was provided and the diets were correctly formulated and mixed (Doepel et al., 2009). In France, in cows fed a maize and grass silage diet supplemented with wheat processed by different methods (23% diet DM), ground and pelleted wheat gave higher milk yields and higher milk fat yields than dry-rolled or moist-rolled wheat. None of the processes caused acidosis (Cabon et al., 2002). In Canada, feeding high moisture wheat to dairy cattle (6.1 kg/d DM, 30% diet DM) resulted in lower feed costs than feeding high moisture maize, due to the need for less protein supplementation and more milk being produced, possibly the result of a more digestible diet. High moisture wheat was considered to be a good alternative for dairy cows in areas where maize does not grow, because wheat requires a shorter growing season than maize (Petit et al., 1996). Feeding wheat to beef cattle requires the same precautions as for dairy cows. In moderate to high grain rations (50% or more concentrate), wheat should be fed in combination with more fibrous or slowly fermented feed grains and limited to 40% of the diet. Beef cattle should be adapted by introducing wheat into the ration at low levels (10 to 15% of the diet) and increasing the level in steps after a period of several days of constant intake and appetite. Cattle should not be offered higher concentrate levels until intakes are consistent. The feed should be offered two, or more times, per day, in restricted amounts, with plenty of roughage, and in a total mixed ration. Self-feeding wheat should be avoided (Lardy et al., 2000). Coarse-rolled durum wheat fed to beef cattle resulted in poorer intake, weight gains and feed conversion than hard red spring wheat, perhaps due to its higher gluten strength. Inclusion rate of durum wheat for beef cattle should not exceed 30% (Lardy et al., 2000). Wheat grains can be fed to sheep. Recommendations are up to 25% for lambs and 35% for ewes (Ewing, 1997). Feeding wheat to sheep (ewes and lambs) has been extensively studied in Australia, particularly in the "wheat-sheep zone" in southern Australia. In this region, wheat (as well as oats and barley) are commonly used as energy supplements during short seasonal droughts. During long-term droughts (6-18 months), wheat grain can be the cheapest source of energy for supplementary feeding to sheep (McGregor, 2006). Wheat-dominant diets and even wheat-only diets are used (Jolly et al., 2007; McManus et al., 1973), but a minimum of 10-20% roughage is recommended in Australia to prevent acidosis and mortality in both lambs and ewes. For instance, ewes fed only wheat grain failed to produce adequate quantities of milk, resulting in increased lamb mortality (Reynolds et al., 1972). Unlike cattle, processes such as rolling, flaking and grinding are not advisable in sheep as they increase fermentation rates and the risk of acidosis (Pulina, 2004). Lambs have been found capable of digesting whole grains as efficiently as the processed forms: lambs fed whole or rolled wheat had significantly higher average daily gains than lambs fed pelleted wheat (Tait et al., 1973). However, in a later experiment with lambs, pelleted wheat was found to be more digestible than whole wheat (Orskov et al., 1974a; Orskov et al., 1974b). However, responses to either the physical form or mode of presentation of the ration appear inconsistent. Feeding whole grain was also preferable to processed grain to avoid the production of soft fat associated with high levels of propionic acid (Jolly et al., 2007). With early-weaned and artificially-reared lambs, pelleting can improve the palatability of wheat grain (Bell, 2003)..
Few data are available about the use of wheat grain in goats. In China, growing castrated goats fed a maize stover-based diet containing either 25% (diet DM) wheat or maize grain had similar intakes but growth rate was higher with maize (Yang et al., 2012). In Argentina, dairy goats fed an alfalfa silage-based diet with 33-36% of either wheat grain, sorghum grain or dried citrus pulp had similar milk yields, indicating that the three sources of energy were interchangeable (Danelon et al., 2010). In the wheat-sheep zone of Australia, wheat grain is fed to goats during seasonal or longer droughts. In an experiment with castrated Angora goats, it was found that long-term feeding of whole wheat required the provision of 25% hay in the diet to ensure adequate energy intake and animal health. Animal losses during the experiment showed that wheat-fed goats had to be protected against acidosis, enterotoxemia and vitamin E deficiency (McGregor, 2006). Wheat grain is commonly used for feeding pigs in some countries. It is very palatable to pigs if not ground too finely and can be used efficiently by all classes of pigs. Wheat grain can replace maize grain entirely in all pig diets as long as they are balanced for NE (net energy) and standardised ileal digestible (SID) amino acids. In concentrates, wheat can be included at up to 30% for growing pigs and up to 50% for fattening pigs. In a review of wheat samples reported in the literature, DE (digestible energy) content in growing pigs ranged from 13.3 to 17.0 MJ/kg DM (Kim et al., 2005). Most studies dealing with the energy evaluation of wheat-based diet have been conducted in growing pigs (more than 40-60 kg), and the derived energy values are then generally used in diet formulations for all classes of pigs. However, higher energy values should be used for adult pigs, even though the difference is numerically low (+ 1.5 percentage points in energy digestibility or + 0.2 MJ DE; Noblet et al., 2000; Noblet et al., 2002). Wheat contains 92 to 95% of the DE and NE content of maize (Noblet et al., 2002), due to a lower lipid and starch content and a higher NDF and non-starch polysaccharides content. The protein content and the concentration of SID amino acids are generally higher in wheat than in maize. In particular, the SID lysine and tryptophan concentrations are 30 and 25% greater than in maize, respectively (Noblet et al., 2002). As a consequence, less soybean meal is needed when formulating wheat-based diets than maize-based diets. Processing technology can affect the energy value. The inclusion of whole wheat grain limits the digestive utilization of energy compared to hammer-milled, rolled and pelleted wheat when fed both to weanling and growing pigs (Ivan et al., 1974). Additional factors such as duration of post-harvest storage or enzyme supplementation (xylanases, etc..) are likely to influence the energy value of wheat grain (Kim et al., 2005). Moldy wheat contaminated by mycotoxins can cause a drastic decrease in feed intake and possibly abortions in gestating sows. Wheat grain, particularly from soft varieties, is one of the main ingredients used in poultry diets, notably in Europe, Canada and Australia. Wheat is used as an energy source due to its high starch content. It is very palatable if not ground too finely and can be used efficiently by all classes of poultry. In countries where wheat is commonly used to feed poultry, conventional broiler diets typically contain 60% wheat or more (Blair, 2008). A similar inclusion rate (60%) has been proposed for laying hens, while recommendations are slightly higher for breeders (65%) and lower for chicks (50%) (Ewing, 1997). The ME value depends greatly on the starch content and on its digestibility, notably in young birds. Starch digestibility and the ME value of wheat are highly variable (Mollah et al., 1983). This variability is attributed to kernel hardness, viscosity and the presence of α-amylase inhibitors (Carré et al., 2007). Wheat can replace maize entirely, but performance tends to be lower unless wheat is supplemented with appropriate enzymes (Blair, 2008). Wheat can be used as whole grain with a concentrate complement with no detrimental effects on broiler performance and with positive effects on the digestive tract (Williams et al., 2008). Good results are obtained when wheat is coarsely ground (hammer mill screen size of 4.5-6.4 mm) for inclusion in mash diets. Wheat should not be ground too finely, as this may cause discomfort in eating (unless the diet is pelleted), increase moisture absorption and subsequent feed spoliage and reduce feed intake (Blair, 2008). Treatments such as pelleting and extrusion can increase digestibility but too harsh treatments may be detrimental to the nutritional value by inactivating endogenous enzymes such as xylanase and phytase (Carré et al., 2002). The presence of soluble carbohydrates (arabinoxylans) in wheat tends to increase intestinal viscosity, affecting digestive function. For instance, viscosity negatively affects the digestibility of dietary lipids (Carré et al., 2002). In order to counter those effects, it is now commonplace to use exogenous enzymes, such as xylanase-based enzymes, resulting in higher ME values for the wheat and better performance (Blair, 2008; Choct, 2006). Enzyme supplementation permits an increase in the inclusion rate of wheat in the diet without decreasing performance (Choct, 2006). Added enzymes also help to reduce problems with sticky droppings (Slominski, 2011). Responses to enzyme supplementation depend on the age of the bird. More mature birds, because of the enhanced fermentation capacity of the microflora in their intestines, have a greater capacity to deal with soluble carbohydrates (Blair, 2008). Replacing maize with wheat in broiler and layer diets tends to reduce the xanthophyll content of the diet, resulting in less pigmentation of the broiler skin and egg yolk: supplementary sources of xanthophylls may be necessary when the market requires pigmented chickens and eggs (Blair, 2008). Wheat grain can be used in feeding growing or breeding rabbits with few technical limitations. It was used in 25% of the experiments presented at the 9th World Rabbit Congress in 2008 (Lebas et al., 2009), the average inclusion rate being about 13%, but higher rates of 20-30% were used in studies on cereal grains (Pinheiro et al., 2000; Karamjit et al., 1999; Cossu et al., 2002; Gidenne et al., 2005). In other experiments, wheat grain was used at 40-42% (Seroux, 1984) and even up to 56% (Lebas, 1976) without causing health problems. One of the values of including wheat in rabbit diets is its positive effect on pellets quality, even at low levels of inclusion (Molti, 1996). The type of soft wheat (high-starch grown for human consumption or low-starch grown for feed grain) has little incidence on its utilization by growing rabbits: both types result in similar growth rates and feed efficiency with no correlation with the starch content (Seroux, 1984). Likewise, a comparison of durum wheat and common (soft) wheat showed that the wheat species had no effect on feed intake and digestion in growing rabbits (Sequeira et al., 2000b). Various processes have been tested to improve the feeding value of wheat for growing rabbits, with limited success. Flaking failed to improve diet utilization (Lebas, 1976; Seroux, 1989). Grinding durum wheat finely or coarsely before inclusion at 30% of the diet did not increase nutrient digestibility and extrusion reduced its energy value by 4.5% (Sequeira et al., 2000a). Treating a diet containing 30% wheat with an enzyme mixture (amylase + xylanase + β-glucanase + pectinase) did not effect any digestive parameters (Sequeira et al., 2000b). The failure of these treatments to improve the nutritive value of wheat is probably due to the very high digestibility of raw wheat starch in the rabbit's small intestine (92 to 99%) and at faecal level (99.2 to 99.7%) (Blas et al., 2010). Sprouted wheat grain (germinated for 10 days and wilted indoors for 3 days to reach 52% DM), distributed ad libitum in addition to a standard pelleted feed to breeding does for 6 days before each artificial insemination in a 6 month-experiment, induced a significant improvement in litter size (7.7 vs. 6.8), related to better receptivity of the does (Rodriguez de Lara et al., 2007). However, because of the small number of does per treatment (24 does over six months), further experiments are necessary until this technique can be recommended. Wheat has an energy content similar to that of maize and a protein value similar to that of oats (Martin-Rosset, 2012). It is thus a useful energy grain for horses, but wheat has a reputation for causing colic and digestive upsets in horses: if not chewed efficiently, it may result in large amounts of starch passing into the hindgut, causing hindgut acidosis with digestive disturbances, hyperactive behaviour and a high risk of laminitis. Finely ground wheat is likely to result in the formation of a sticky mass of gluten in the stomach, preventing gastric acid attack and increasing the risk of fermentation with gas build-up and colic (Kohnke et al., 1999). However, wheat can be a safe ingredient for horses when it is carefully fed and slowly introduced to the ration. Quantities should be limited to 0.5 kg per 100 kg LW per day and fed in several meals during the day. In France, an experiment showed that it was possible to feed up to 1-1.5 kg of wheat (in three meals) to young horses provided that feeding was well controlled (Martin-Rosset, 2012). However, high amounts (over 3 kg/day) of wheat grain should not be given to horses (Trillaud-Geyl et al., 2006). Wheat is less palatable than oats or maize: adding molasses can increase its palatably, provided that only limited amounts are fed, as the sweetened feed is likely to be consumed more quickly. Wheat is best fed cracked or coarsely ground. The cracked grain is often dusty and should be dampened and progressively introduced over 7-10 days (Kohnke et al., 1999). Processed wheat grain is used as a source of energy in fish species. In Atlantic salmon fed extruded diets containing up to 45% whole wheat, there was a tendency towards reduced growth and starch digestibility with increasing dietary inclusions of wheat. Provided diets were nutritionally well balanced, Atlantic salmon accepted diets where wheat carbohydrates contributed up to 24% of the digestible energy (Arnesen et al., 1993). In a comparison of various ingredients (wheat, pea, beans, lupins, oats, corn gluten meal and oil meals), a diet containing 14% wheat resulted in a significantly higher viscosity than the other diets, but the wheat-based diet was found suitable for salmon (Aslaksen et al., 2007). In Atlantic salmon fed 10 or 15% precooked rye or wheat replacing fish meal, protein and starch digestibilities were found to be identical but digestibilities of dry matter and energy were higher for wheat-based diets and for the diets with 10% grain (Thodesen et al., 1998). In rainbow trout, whole wheat (in an extruded diet) had a lower energy digestibility (32%) than that of other grains (maize, barley), cereal brans (wheat, rice) and wheat flour but its protein digestibility (85%) was the highest (Gaylord et al., 2008). In a comparison of waxy (amylopectin-rich) and non-waxy (amylose-rich) extruded wheats, waxy varieties had a higher starch digestibility (due to the higher digestibility of amylopectin) but similar energy digestibility and a lower protein digestibility (Gaylord et al., 2009). In a comparison of extruded and non-extruded wheat, the dry matter and energy digestibility of extruded wheat was found to be much higher than that of non-extruded wheat (71-77% vs. 47-54% respectively), but digestibilities of protein and fat where slightly lower (Cheng et al., 1993). Carp fingerlings were successfully fed with wheat in a balanced diet at different stocking rates (1500 to 3000 fingerlings per ha) (Szumiec, 1993). In a comparison of several cereal grains (wheat, maize, barley, rye and triticale) fed to carp as supplementary feeding, no organoleptic differences in carp flesh were found between the grains (Vacha et al., 2006). In a similar experiment, levels of polyunsaturated fatty acids in fish fed supplementary cereals were found to be similar for all the grains but lower than those of fish fed natural diets (Vacha et al., 2007). In a comparison of cooked and processed vs. raw unprocessed wheat, barley and maize grains fed to sea bream, cooked grain inclusion decreased the growth rate (Davies et al., 2004). In Nile tilapia (Oreochromis niloticus) fed isonitrogenous and isoenergetic diets containing different grain sources (maize, wheat, barley, sorghum and rice) at a level of 25%, the best growth rate was obtained with sorghum, followed by wheat, while body composition was identical for all the grains (Al-Ogaily et al., 1996). In tilapia red hybrid (Oreochromis sp. ), hard wheat included at 30% in the diet had a high protein digestibility (84%) but moderate dry matter and energy digestibilities (66 and 61% respectively) (Vasquez-Torres et al., 2010). In Florida pompano, whole wheat flour compared to other grains (sorghum and maize) and cereal by-products (wheat and rice bran) had the highest dry matter and energy digestibility (Gonzalez-Felix et al., 2010). In Pacific white shrimp fed 30% of various cereal-based ingredients including whole wheat, digestibility was found to be lower than with the control diet, due to the poor digestibility of the carbohydrates. Palatability was acceptable (Davis et al., 1993). Ewing, 1997. The Feeds Directory Vol 1. Commodity Products. Context Publications, Leicestershire, England. Martin-Rosset, W., 2012. Nutrition et alimentation des chevaux. Editions Quae, 624 p.
Pulina, G., 2004. Dairy sheep nutrition. CABI Publishing, 222 p.
Ulvesli, D. ; Prestehegge, K., 1975. Unpublished data. Norg. Landbr. Hogsk. van Ginkel, M. ; Villareal, R. L., 1996. Triticum L.. Record from Proseabase. Grubben, G.J.H. & Partohardjono, S. (Editors). PROSEA (Plant Resources of South-East Asia) Foundation, Bogor, Indonesia.